Burns Night, in effect a second national day, is celebrated on Burns’s birthday, 25 January, with Burns suppers around the world. 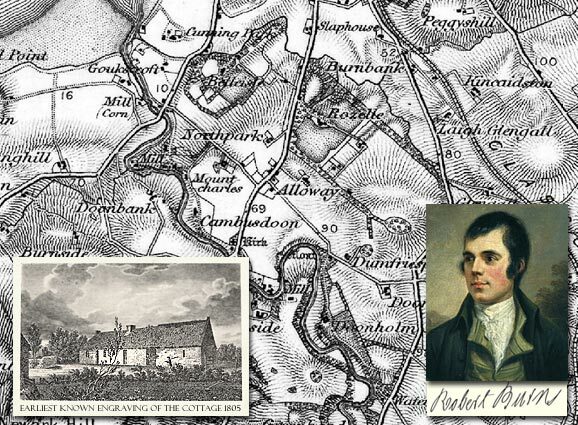 The first Burns supper in The Mother Club in Greenock was held on what was thought to be his birthday on 29 January 1802; in 1803 it was discovered from the Ayr parish records that the correct date was 25 January 1759. The format of Burns suppers has changed little since. The basic format starts with a general welcome and announcements, followed with the Selkirk Grace. After the grace comes the piping and cutting of the haggis, when Burns’s famous “Address to a Haggis” is read and the haggis is cut open. The event usually allows for people to start eating just after the haggis is presented. This is when the reading called the “immortal memory”, an overview of Burns’s life and work, is given. The event usually concludes with the singing of “Auld Lang Syne”. This entry was posted in Genealogy, History, Map of the week, Old Series Edition, Special Events and tagged Britain, Genealogy, Heritage, history, Maps, Placenames, UK by Cassini. Bookmark the permalink.